FILE - A limousine burns in downtown Washington following the inauguration of President Donald Trump, Jan. 20, 2017. The government dismissed charges against the remaining 39 defendants in the Inauguration Day riot case after 21 defendants pleaded guilty, including one person who pleaded guilty to felony offenses. The U.S. Attorney’s Office for the District of Columbia said it believes a riot occurred Jan. 20, 2017, causing more than $100,000 in damage to public and private properties. The government previously dismissed charges against 129 defendants in January to focus on 59 people believed most responsible for the violence and damage. "In light of the results in the cases brought to trial, however, the U.S. Attorney’s Office has now moved to dismiss charges against the 39 remaining defendants in this matter," the U.S. Attorney's Office said in a statement Friday. Dramatic video evidence from the first trial of those charged in the Inauguration Day riots shows destruction and confrontations on the streets of downtown Washington. Mark Segraves pored over hours of video. The U.S. Attorney's Office first moved to dismiss charges against 38 defendants Friday but later filed another motion to dismiss in the case of a 39th defendant. More than 200 were arrested and charged with rioting after self-described anti-capitalists broke windows and set fire to a limousine in downtown Washington, D.C. According to court documents, organizers of the march encouraged protesters to wear black clothing and used the term "black bloc," which prosecutors say is a tactic when members within a group plan to use violence or destruction. Within minutes of leaving the Logan Circle gathering place about 10:20 a.m. Jan. 20, 2017, members of the march started damaging and destroying public and private property, according to court documents. About a half hour later, about 200 people charged a police line set up to contain them at 12th and L streets NW, according to court documents. Some got through, but police contained the rest. Many defendants claimed they were swept up in a mass arrest for no reason. The first six defendants to stand trial were found not guilty. Prosecutors acknowledged not having any evidence of those six physically contributing to the damage but argued they were responsible for the rioting because they moved through the city with the larger group. Images of officers rounding up dozens of protesters from officers body cameras and the protesters’ viewpoint were shown in the trial. Cellphone videos show demonstrators smashing out windows of businesses as they marched downtown. Some video shows innocent bystanders ducking for cover in a restaurant as a rioter smashed out the windows. 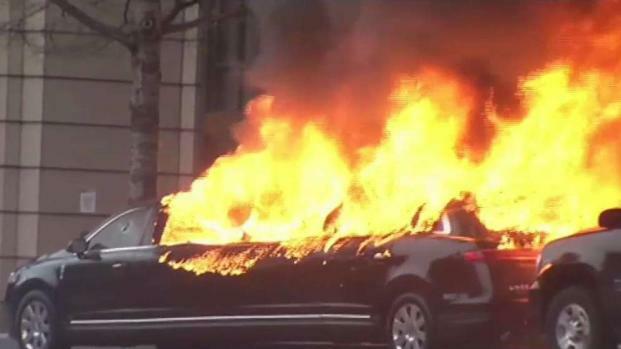 The attack on a stretch limo on K Street is seen from several angles, ending with a demonstrator throwing a lit flare into the limo, which burst into flames moments later. There also are scenes of protesters spraying graffiti.